Use the following form to add your comments to the Harry Nilsson web pages. The article you are commenting on is shown at the bottom of this page.Your comments will not appear on the web site to other visitors until after they have been reviewed. Use this form only to enter comments you want to have displayed to other visitors. If you have a question about the web site or this article, you may send an email to webmaster@nilssonschmilsson.com. Simple Question To reduce spamming by robots, please answer this simple question. 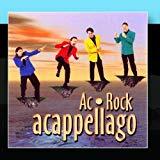 Ac-Rock is a Chicago, Illinois, a cappella rock 'n roll group. The members of the group are Paul Iams, J.D. Mathein, Chris Brown, and Mark MacLean.